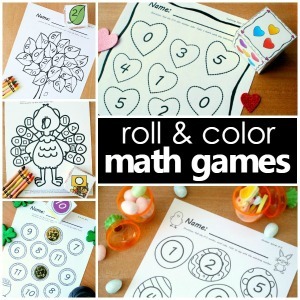 Number games are a fun way to help kids with number recognition and counting. The more hands-on we can make them the more fun kids will have, and the more likely they are to remember the content. 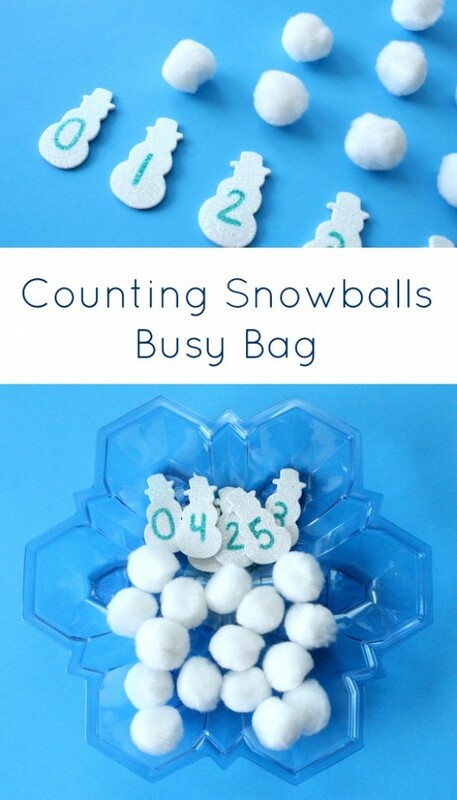 This counting snowballs winter math activity was quick to put together and both my preschooler and kindergartener can use it in different ways. Here I am presenting it in two ways so you can choose the option that best meets your needs. First we’ll make a quick DIY math busy bag, and then we’ll take a look at a free printable option if you’d rather print and play instead. Busy bags can be a very convenient way to incorporate some hands-on learning time. Whether you use them in the classroom, on the go, or as a component in your home activities, they are handy to have around. Now that Tinker has started preschool outside of the home for two days during the week I am making a few busy bags and learning activities that correspond to the themes they are focusing on in the classroom. That way she can do a little bit of hands-on learning at home too. 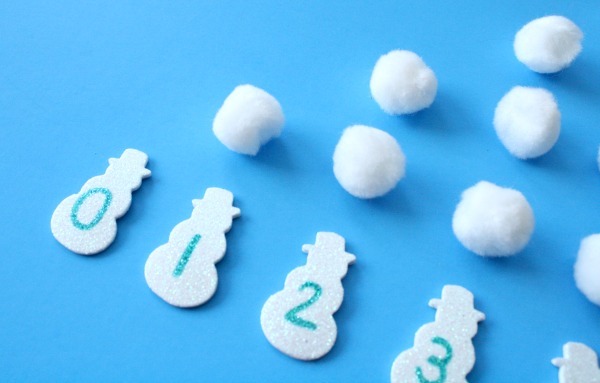 To prepare the activity I gathered fifteen white pom poms and six small foam snowmen. 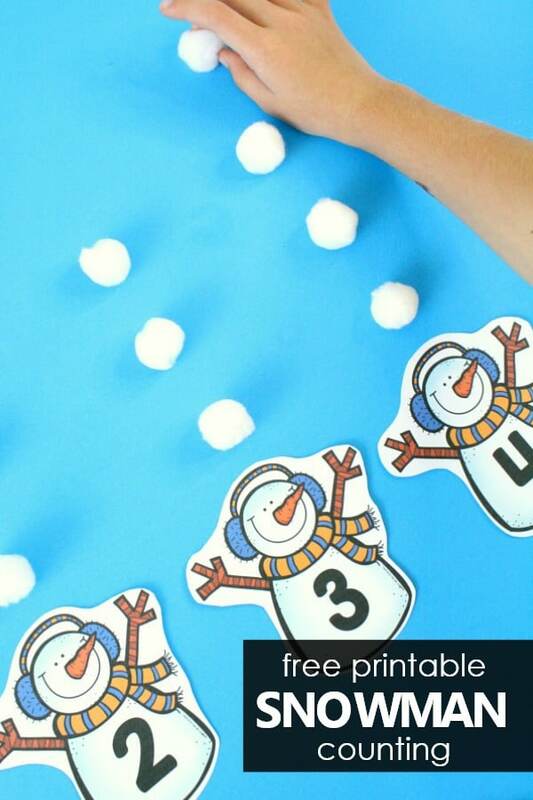 We had the snowmen in our craft stash, but you could use any size foam snowmen or even cut out your own paper ones. 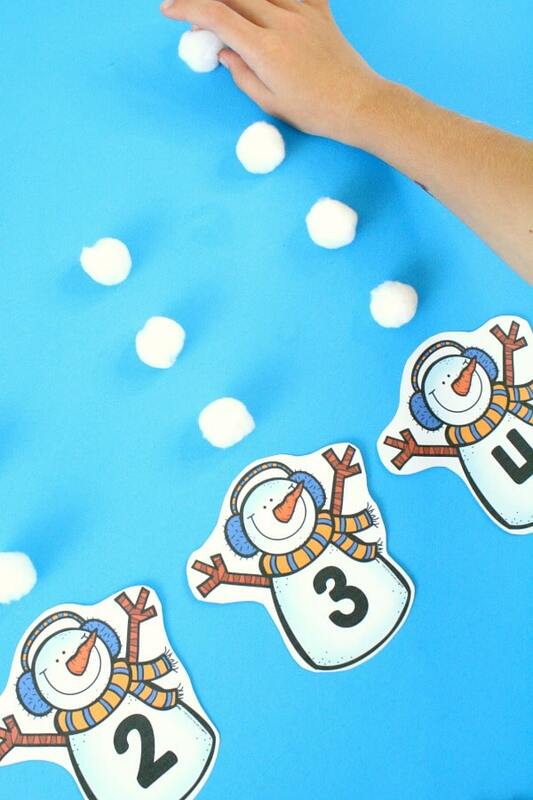 Better yet, let your little one make six snowmen to use in the busy bag and incorporate some art and scissor skills! 1. 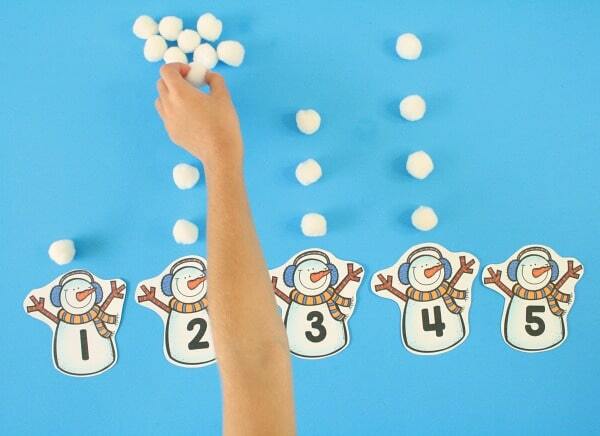 Place the snowmen in order from zero to five. 2. 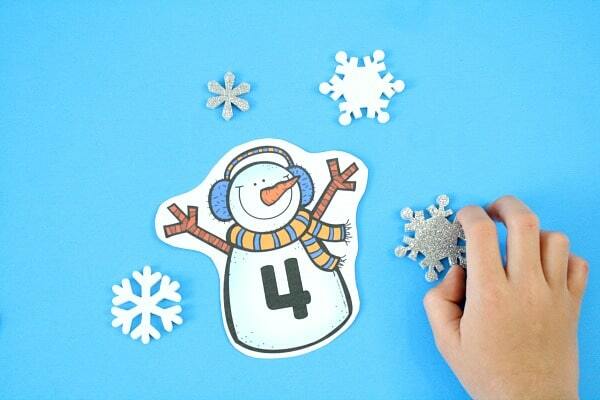 Add the appropriate number of snowballs above the snowman’s head. 1. Count all the snowballs to see how many there are in all. 2. Compare the amounts. For example show that five is great than four or that one is less than three. At the most advanced level, ask kids to identify how many more (or less) a certain number is than another (for example, 3 is 2 less than 5). My kindergartener is focusing on addition right now. This busy bag is easy to use for that as well. She simple chooses two snowmen from the bag. Then she gathers that correct amount of snowballs for each and combines them. Finally she counts to see how many snowballs there are when the two amounts are combined. 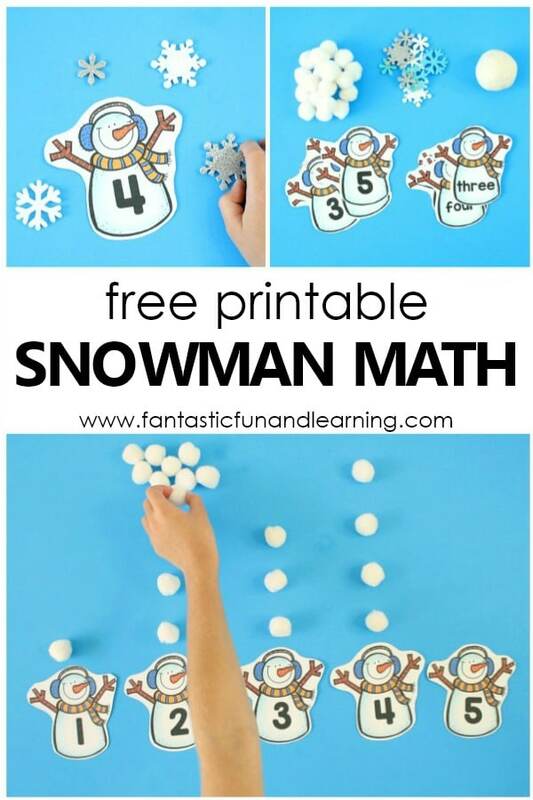 If you’d rather print and play instead of creating your own snowmen, grab the free printable snowman numbers. 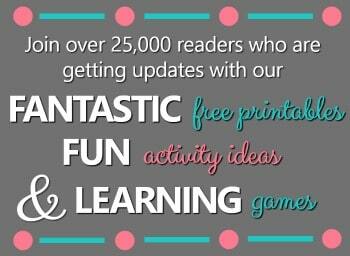 In addition to using pom poms, you can switch up the manipulatives you use. Here we added in foam snowflakes and white play dough. Buttons or glass beads would also be great options for loose parts. 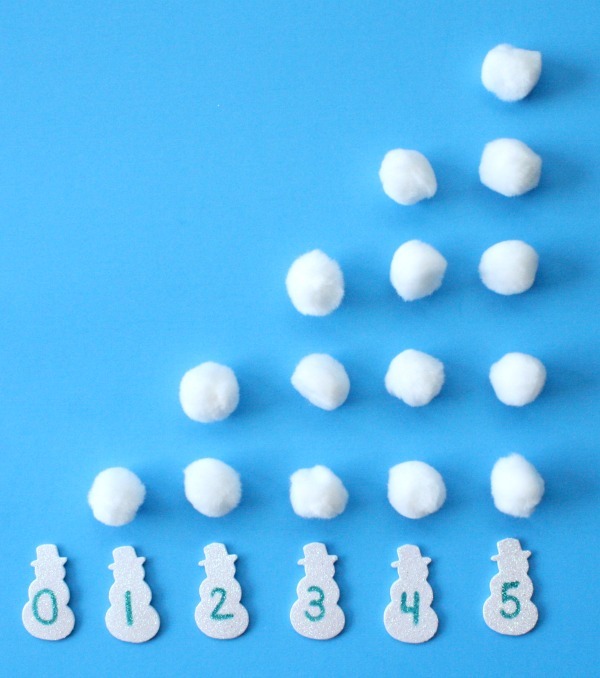 Have kids match manipulatives to show the number (or number word) on each snowman. Have kids show different ways to show a number by using two different kinds of manipulatives. 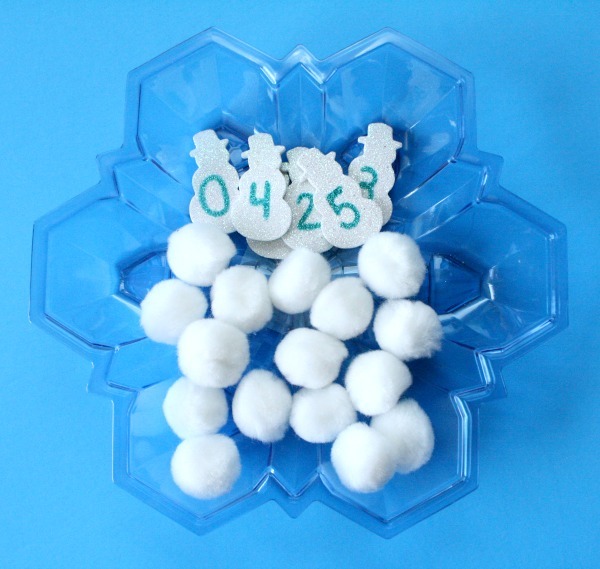 For example for the number 6, a child could show 2 snowballs and 4 snowflakes. Do this in small group and discuss the different ways kids come up with to show the same number. 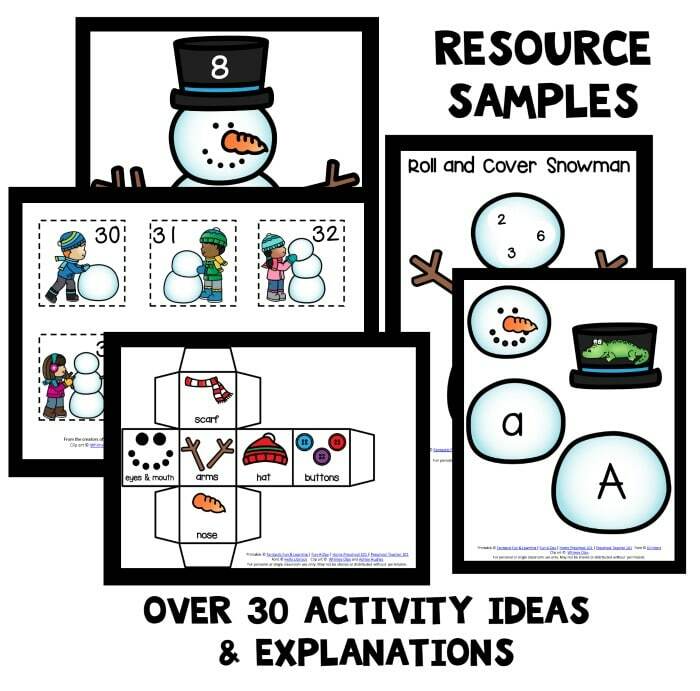 Kids also enjoy lining up the snowman and creating an organized grid as discussed above in the busy bag section. It’s an excellent way to help them visually see one more and one less. 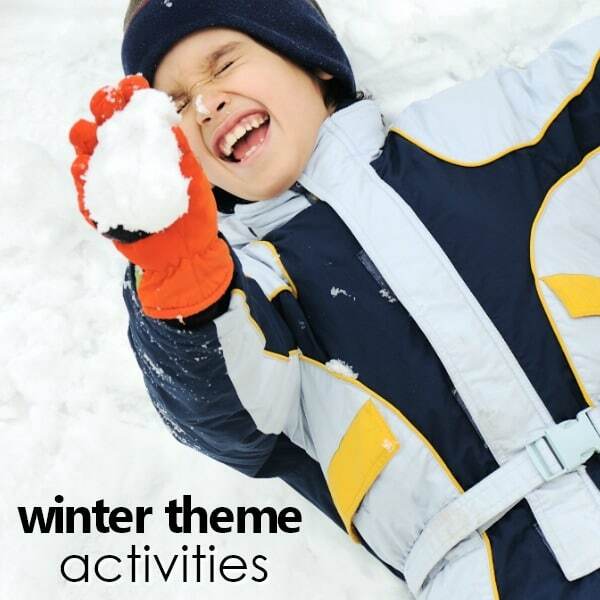 Visit our winter theme planning guide for more ideas to go along with favorite winter themes.